Objective: Ball start with the goalie and looks to roll the ball into either L or R Defender. Start this Rotation without a defending team. 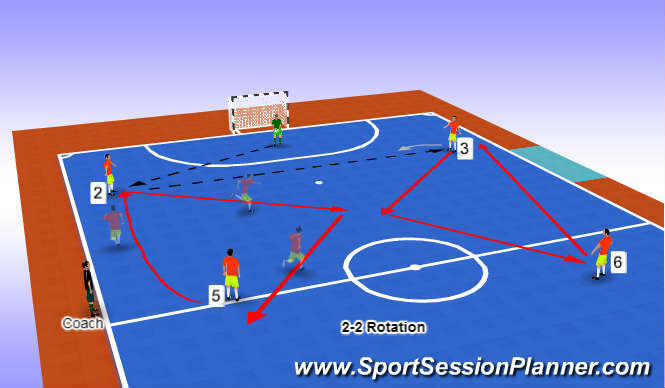 Player 2 receives the roll out from the goalie and plays a ball into 3, immediately 2 makes an attacking diagonal run through the middle, 5 looks to interchange and drop into the space left by 2. Once 3 Receives he must assess can I play a penetrating pass into 2 for a break out? If the pass isn&apos;t on he will play pass back into the space which has now been filled by 5. If 3 plays pass into 5, player 3 makes a diagonal run into the middle as like did player 2, Run is central then out to switch into position with 6. Once player 3 has made the attacking run 6 must drop in to the space creating the width required to attack in drop into 3&apos;s previous position. Coaching Points: Quality and accuracy of pass, Is the pass negative or positive? Reception with sole of foot? take first touch into the middle to balance your attack so you can penetrate with a pass, dribble or run. Of the penetrating option is off, lay ball off into cycling player. Body position of runs, type of runs and Communication.